We have an Easter tradition of eating exotic meats, but I’m not really sure where it started. I can remember Easters where we had duck a l’orange, bison, ostrich. Last year, we had lamb, which was a bit pedestrian for us. Maybe that’s why Kristi decided this year that we must have alligator. She called me up special at work to let me know, and with a gulp, I said okay. That was the whole point of our exotic meat Easters: to challenge our palates. The day before Easter, I accompanied Kristi and her boyfriend Ed to Chinatown to shop for our exotic meats. In Chinatown, you’ll find food in its rawest form. One time I left a studio after drawing dancers in rehearsal and saw a truck open with five pigs being unloaded, their heads, legs, and tails perfectly intact, along with their pink color. The cooks acted like it was no big deal, but I think I’m permanently scarred. Walking down the streets, you might see duck carcasses strung up by their necks in shopwindows, like some kind of bizarre meat garland, and it was no different when we walked into the Chinatown meat shop. While Kristi and Ed browsed the alligator claws, picking out the best ones, I looked inside strange aquariums and buckets to find frogs and live swimming eels. Food feels very primal in Chinatown, like when you eat something, it means a little bit more than just filling up the breadbasket. Once Kristi and Ed purchased the alligator claws, they stored them in a handy cloth cooler bag that they brought along for just that purpose, and I was able to forget about them for the evening. 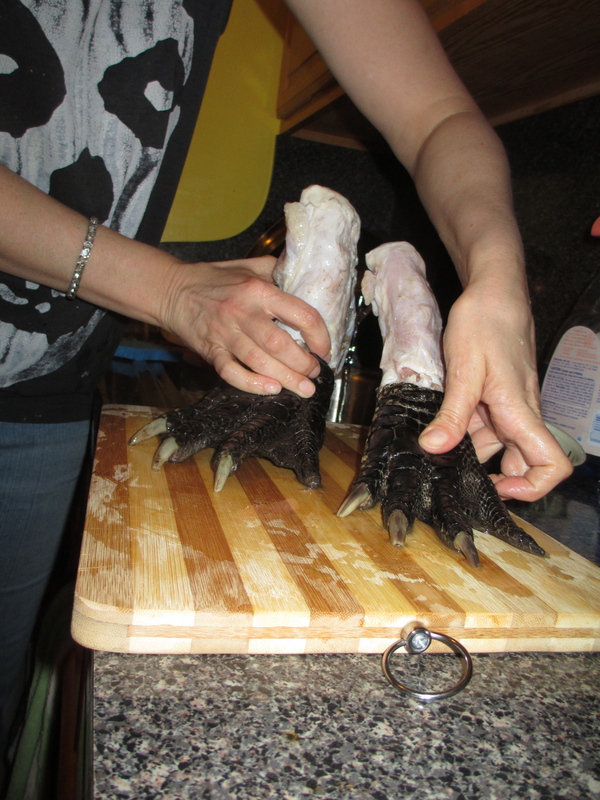 Sunday came and Kristi and Ed came over at around 4 p.m. to start preparing the grand alligator meal. I bought wine, a little puzzled about what would pair nicely with alligator (I chose a white that didn’t taste too much like cat pee), and a lot of beer, which we all decided would be just fine. Kristi said it would take a few hours to make the meal and that worked well for me since I was knee-deep in edits for a Regency romance. While Kristi and Ed chopped and sautéed, I read about breeches, redingotes, and heaving bosoms, looking up such things as the time period when condoms were invented and if the word touchy-feely existed circa late eighteenth century (it didn’t). At a certain point, Kristi called me to look at the alligator claws in our kitchen sink, and I was super-creeped out as I took pictures, filled with a combination of both repulsion and awe, thinking, I’m going to eat this; I’m really going to eat this. Kristi told me she would be blackening the alligator so it would be done rather fast. I returned to the Regency romance, but I couldn’t get back into the world of whether this married couple would stay together or not. I had a real problem on my hands. I had to eat alligator. I started googling things like What does alligator taste like? The answer came back that the best meat of an alligator is its tail (unavailable in Chinatown) with a taste like spongy chicken. Okay, I thought I might be able to handle that. Then I remembered how some ancient warriors would defeat their enemies in battle and eat their hearts in order to take on their fierce traits. We were on the precipice of April, my special month of transformation and spring, renewal, and hopes for the next year. By eating alligator, I decided I would take on the qualities of an alligator. Fearlessness, silence while lying in wait for prey or enemies, amazing strength, and cunning would be mine. I could hear coughs coming from the living room, and then Kristi came knocking on my door to say that dinner was ready. Steeling myself, I opened the door and found the house filled with smoke from the alligator blackening. 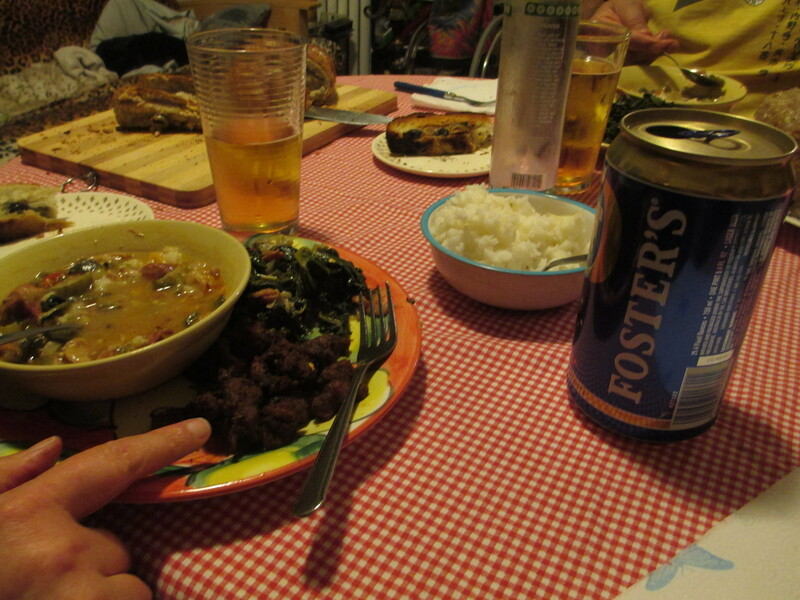 Ed set up a fan in the living room to direct the smoke out the windows, and after pouring some cold ones for us three, I sat down to a plate full of stew, collard greens, olive bread, and something that looked like chicken nuggets. I was so relieved that the alligator was somewhat disguised and looked nothing like the claws I saw in the sink. We gave each other significant looks and took up our nuggets. The first one tasted brackish to me, like drinking tank water, but I was determined to take on my alligator qualities. I experimented by eating the alligator nuggets plain, dipping them in stew, and wrapping them in collard greens. The last worked the best, and I was able to wolf most of my nuggets that way. At a certain point, though, I had to stop. Ed had called it quits way before me, declaring, “I don’t like alligator.” Of the three of us, it was only Kristi who really had a taste for it. After our dinner, so stuffed we could barely bend, we put in our carefully selected Easter movie, The Great Santini, featuring a couple of the best smart-asses to ever grace the screen: Bull Meechum and my personal favorite, his redheaded daughter Mary Anne Meechum. Of course, I forgot about the soup scene at the beginning of the movie, but despite that, it ended up being a perfect choice. The Meechums embody the qualities of alligator and alligator came up twice in the movie, causing everybody to drink. Now it gets me thinking about next year. I think I might need a lion’s heart.